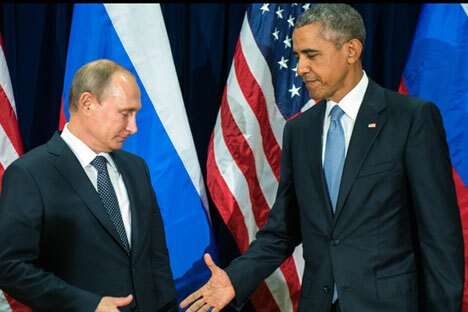 Valdimir Putin and Barack Obama shake hands for the cameras before the start of a bilateral meeting at the UN headquarters in New York, Sept. 28, 2015. Russian President Vladimir Putin and U.S. President Barack Obama will discuss at a meeting in China during the G20 summit the Syrian settlement issue, Russian presidential press secretary Dmitry Peskov told journalists on Aug. 31. "No separate full-format meeting (between Putin and Obama) as such is planned at the moment, nevertheless, we assume that it is very likely that Putin and Obama will have an opportunity to talk on the sidelines of the summit," said the Kremlin official. According to him, "Certainly, it is fair to assume that there will be a certain brief or a more detailed exchange of views on the Syrian affairs." Peskov said earlier that Moscow would like to see the United States’ greater readiness for real cooperation over Syrian settlement. "We are still far away from real cooperation, to our regret," Peskov said. The G20 summit will be held in China on Sept. 4-5. The previous meeting of Putin and Obama was held in late November on the sidelines of the UN Climate Change Conference in Paris. Before that they had a conversation during a G20 meeting in Turkey in November 2015. Read more: Have Russia and the U.S. managed to agree on Syria?